i didn't intend to have a themed shirt today since even when i was in a relationship i don't do valentine's day but it occurred to me that because i was busy and never drove in that direction i neglected to order my annual box of Chocolate dipped strawberries. Woe is Kia. Today's shirt is from the place i usually order this box of yummy goodness, Goodberry's. This shirt is a 2-sided shirt. 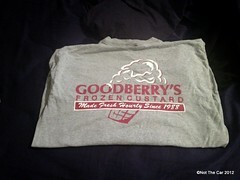 Years ago Goodberry's would give these shirts away as a contest prize for submitting a photo of you enjoying their frozen custard. I never won and i was planning on just sucking it up and buying a shirt. A former store manager gave me this shirt for free because i was a pretty loyal customer (and one of only 3 people who would ever regularly order a Custard soda) They sell far more milkshakes and lime rickey's. there's a 90% chance whenever there was a new employee i was the 1st custard soda they ever made. So this shirt which during the summer you might even see employees wear, I get asked a lot when i'm out and about if i currently or used to work at Goodberry's. No i haven't too much flipping temptation. 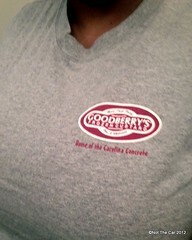 The front has the Goodberry's logo over your left breast. The back is rather large and features a more detailed Goodberry's logo. I've had these shirt several years now but its still available for purchase. Its $14.95 and comes in both child and adult sizes up to XXL. Mine is a size large. Its a cotton/poly blend and i recall a tiny bit of skrinkage about the 1st wash. it got shorter but tighter.